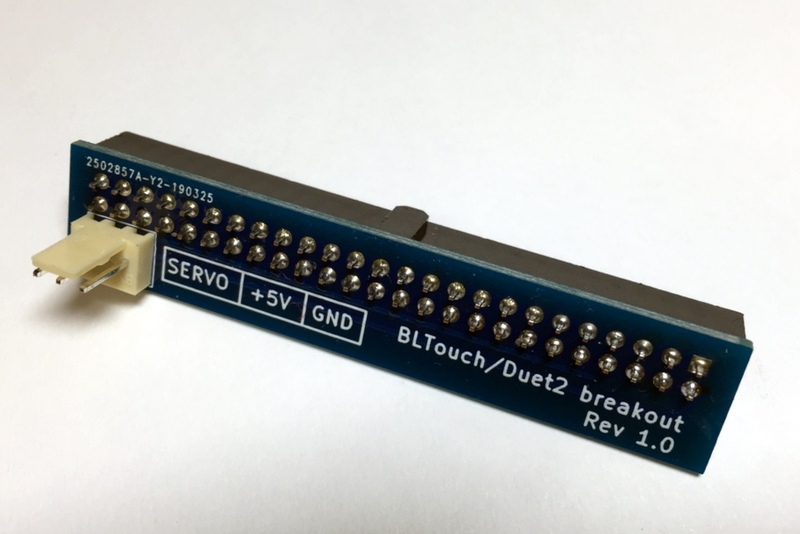 In case anybody is interested, here is a simple breakout board for connecting BLTouch servo connector to Duet2 Wifi. You can order the board from any PCB vendor (try pcbshopper.com). If you are not familiar with PCB orders, oshpark.com is probably the easiest. I have 4 spares bare PCBs that I can mail for free within the US. Got any photos of it? Will it work if you have a duex5 attached? If you have a DueX attached, you can use one of the servo connectors on the DueX. As for the DueX, as @dc42 said, you don't need this breakout board and I believe this will also be the case with Duet3 (?). Another option I considered is to rework the DWF2 with a mod wire to have that wire routed to the probe connector. Maybe one day. Correct. Duet 3 has 5-pin connectors for endstops and Z probes. Thanks for the info, good to know. I already have a BL Touch on my small corXY but I'm thinking about adding one to my large IDEX printer with the DueX5. The firewall at work is blocking the picture. I'll check it out tonight.